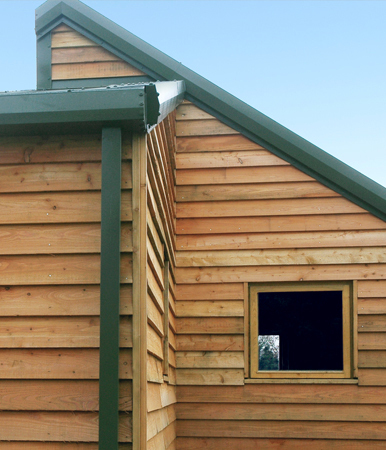 Feather-edge cladding is an ideal solution for those wanting a relatively traditional appearance without it being too rustic. The boards are supplied with a sawn finish but unlike the waney-edge cladding, the edges are straight. Feather-edge boards are formed by sawing a rectangular section at an angle, resulting in two sections tapered across the width. All cladding species are available for this profile. 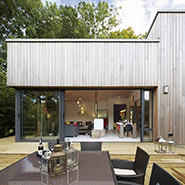 Feather-edge cladding is designed to be laid horizontally with a vertical overlap of approximately 40mm for boards up to 150mm, and 50mm for boards wider than 150mm. 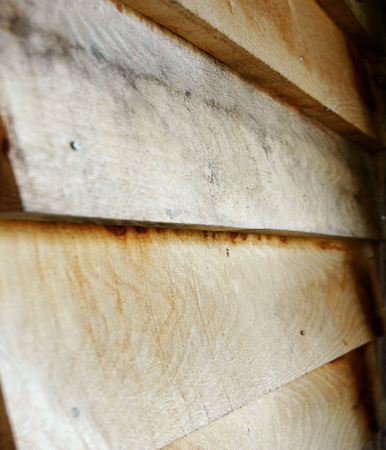 It is important to follow fixing advice, particularly when using green (wet) timber. Begin at the bottom, ensuring that the first board is level. Use a 10mm strip behind the lower edge of the bottom board for support. Overlap subsequent boards by 40 – 50mm. It is important not to reduce the recommended overlap.Feather-edge profiles are generally cut from green (wet) timber and will, as a result, shrink by up to 15mm as the board dries.We recommend that each board is fixed once with a nail located 10mm above the upper edge of the previous board. Some suppliers advise using two nails per board, but this does not allow for shrinkage of the board and can result in splitting.